Are you ready for a future car-buying option of picking out a 3-D printed, cozy, inexpensive automobile? The day is not far, considering the recent announcement by an Italy-based company along with a company based in China. The Italy-based electric car company X Electrical Vehicle (XEV) and 3-D printing material company Polymaker organized a joint press conference at the China 3-D-Printing Cultural Museum earlier this month in Shanghai. The announcement: The first mass-producible 3-D-printed electric car. 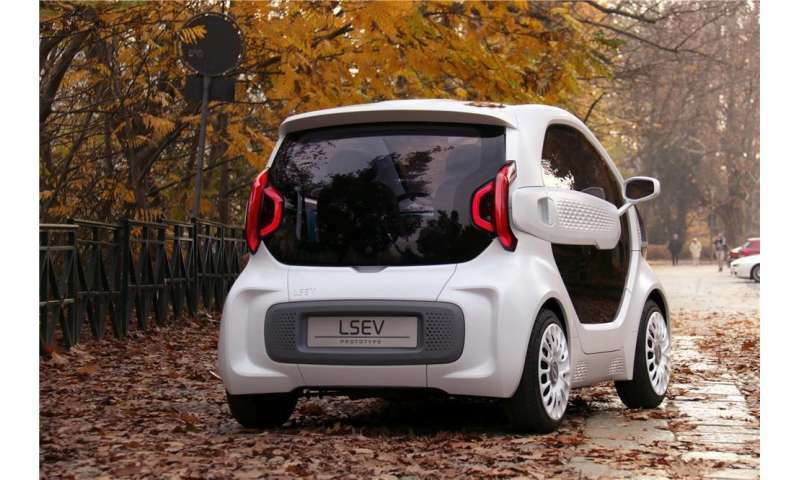 This car, named LSEV, created by XEV, made news for car parts that were 3-D-printed with materials from Polymaker. What does the car look like? As you can see in the video and pictures, the two-seater looks like a little around-town car ideal for easy parking. This car's top speed is about 43 miles per hour, said Andrew Evers of CNBC. Reports said the range will be about 93 miles. Expected costs ranged depending on which site was reporting. The numbers ranged from $9,478 to 9,450 to $10,000. In an interview, Dr. Luo Xiaofan, the co-founder and CEO of Polymaker, talked about mass producing a 3-D printed car and the company's dedication to developing new and functional materials for 3-D printing. Polymaker was founded 2012 and for the last six years their focus has been on materials for 3d printing. While 3-D printing in the beginning was only used for rapid prototyping, a change has come. As 3-D printing becomes more of a production tool, he said, there has been a growing need for high performance materials like engineering plastics. He said the LSEV collaboration and its success could inspire other companies to adopt 3-D printing in final production. Could this 3-D printing technology showing mean revolutionary changes to the automotive manufacturing industry in particular? One obvious benefit is that lighter-weight parts can lead to greater fuel efficiency. The success points for XEV include a decrease in plastic parts and number of components in a car, from more than 2,000 down to 57. The LSEV weighs 450 kilograms (992 pounds), lower than similar-sized vehicles. And while the R&D process of a car model may consume several years, XEV finished a new design in months. "XEV was the brainchild of Guo [Guo Xiaozheng, a senior designer] and a handful of Chinese auto industry professionals, and started less than a year ago," reported Daniel Ren in South China Morning Post (SCMP). SCMP carried a quote by Zhu Li, director of China 3-D-printing Culture Museum. "We are bullish on XEV because it turns 3-D printing into real productivity." Sam Sheehan, Autocar, said, "XEV expects production to eventually total around 500 units per year on a single production line." According to reports, the cars will be available next year. "Could this 3-D printing technology showing mean revolutionary changes to the automotive manufacturing industry in particular? One obvious benefit is that lighter-weight parts can lead to greater fuel efficiency." I think the most obvious benefit is that any change (be it due to car customization wishes by the buyer, differing national regulations, or upgrades due to findings in the field) will not require retooling. Will it pass the required crash tests? That's my question. Technology should continue to creep in in all areas. For ex: Cellphones that are really small & not as good as a PC. Its Main part should be available ASAP for making calls in an emergency. The rest should Climb up and down the belts on our clothes, JOIN together at mid abdominal region to form an ipad-sized or even bigger sized Tablet for WWW Viewing anywhere, anytime !